We not only want to make a difference in the market in terms of the quality of the financial services we offer but also in the selection of our human resource.We believe in continuous investment in human resources development. We pay special attention to the recruitment and selection process, as well as providing continuous training to our team members. It is our belief that the competence and commitment of our staff is crucial in providing high-quality customer service in a responsible manner. We seek team members who are not only interested in a particular position, but also understands our long-term objectives. Furthermore, we believe potential applicants should have a desire for continuous development within the institution and should demonstrate commitment to our ethical and moral approach to banking. Our recruitment process includes job analysis with position specification, sourcing of candidates by networking and other mediums, matching candidates to job requirements and screening individuals.We also assess our candidates to identify their alignment potential with our organization and its requirements by conducting interviews and other such assessment techniques. Value our team members and their impact on the Bank, and their ability to achieve organizational change needed to develop ourselves and the community we serve.Regularly and systematically review our approach so that we always have a balance between equipping our team members to deliver current business goals, preparing them for the changing requirements of future roles and offering the opportunity for personal growth.Innovate and learn from best practice and achieve excellence in everything we do. Develop a leadership strategy that recognizes the benefits of leadership through the integration of business planning, performance monitoring and personal performance and development reviews.Usage technology effectively and create a range of learning opportunities available to our team members. Identify essential skills to be developed in all team members, and minimize training costs by focusing on key development areas; and Improve our recruiting process by identifying high-quality candidates using job descriptions based upon the expertise of our high performing team members holding unique company or industry competencies. Align Individual Goals with Corporate Strategy Our talent management plan is closely aligned with the bank’s overall strategic plan and business needs. At NRB Bank, goal alignment is a powerful management tool that not only clarifies job roles for our individual team members, but also demonstrates their ongoing value to the organization. We engage our team members in their work through such alignments and create greater ownership. Subsequently this makes our team members more committed to the organization and achieve higher levels of job satisfaction. Recruitment and selection based on merit, such as skills, experience and ability, regardless of race, gender, religion or family status. Implement advanced human resource management systems and treat our team members fairly. Provide equal opportunities for training and development, based on our team members’ strengths and needs, to help them explore their full potential. Reward fairly based on aptitude, performance, contribution and capability. At Human Resources, our final goal is to maximize the productivity of the organization by augmenting the effectiveness of its team members while improving their work life and treating them as esteemed resources. 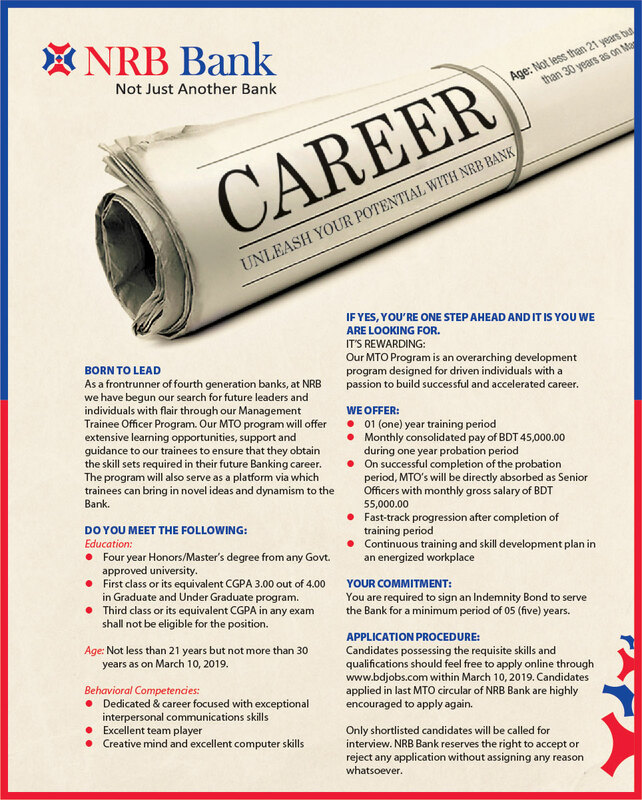 Our team members are our strength and it is on this premise that the HR department of NRB Bank operates.